These June weeks have been drab and grey, overcast and a tad glum until the sun hit hard and strong at the end of last week, leaving our love for summer in Oregon more than a little rekindled. All that unusual coolness has translated to a late season at area strawberry farms. Am I wrong to believe that Oregon’s weather has conspired to save for me the most wonderful treats of the season — strawberries so beautiful, so ephemeral, so special that if you don’t do something with them right away, they’ll just waste away in front of you? Yes, they have come late this year, but for me, they are just in time. We headed to Olson’s earlier last week knowing we wouldn’t have time to process more than a few pounds and spent the morning atop a hill overlooking the Willamette Valley, the din of I-5 masked by the crunch of straw and a crisp breeze. Yes, I know you can get U-pick strawberries for a little less per pound at farms in West Salem, but I’ll pay a few bucks more for the premium view. 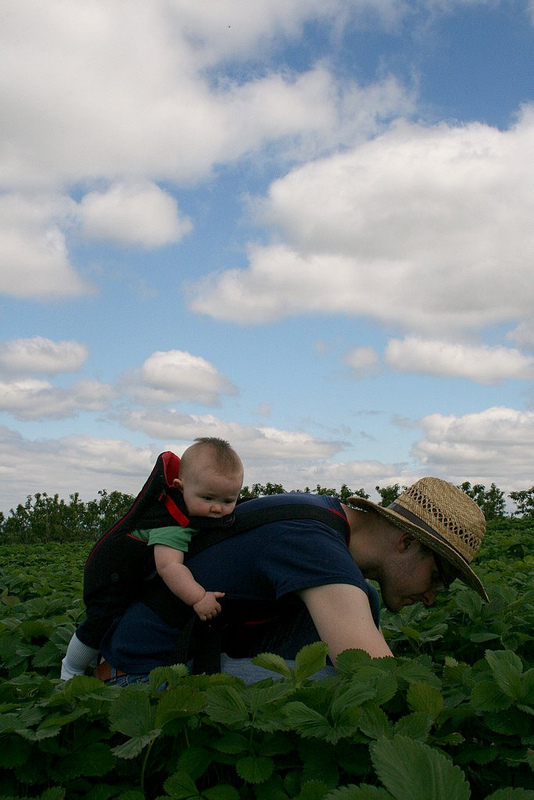 This is our first season of berry-picking with our own strawbaby — probably the first event of many in which we force him to do something together with us that he just doesn’t care for…– but he handled being strapped to my husband’s back pretty well. But just like babyhood, everything beautiful doesn’t last, and neither do strawberries, especially local ones. The pickings were sparse that day, but I am hearing that those berries up there on the hill are warming under green cover into a delightful hue of red. Get them before they’re gone! But what to do with all of these strawberries when they are the May flies of fruit, living for a day and then dying a glorious death? (I know this because no fewer than 10 of my perfect strawberries were already moldering by the end of the day I picked them). Last year I made strawberry jam in an effort to share the taste of Oregon with my family members back East and in the Midwest. This year I’m being a little lazier and a lot more selfish and am working through my favorite new book, Rustic Fruit Desserts by Julie Richardson and Cory Schreiber. It focuses on fruits that grow rampant in the Pacific Northwest including, yes, strawberries. On the docket we have Rhubarb Cream Cheese Pie with Fresh Strawberries and Fresh Strawberry and Ricotta Tart. You may have to process these strawberries quickly, but my experience is that the pies are gone even faster. This entry was posted on June 29, 2010 at 2:43 pm and is filed under Food, There's something about Salem. You can follow any responses to this entry through the RSS 2.0 feed. You can leave a response, or trackback from your own site. Was at Olson on Sat and picked something insane like 16 pounds-many many ripe ones! Managed to make plenty of freezer jam and tons of strawberry shortcake for friends before the smoldering set in! I got a kick out of reading this post because every year I try to make strawberry jam with the strawberries I pick. The best part about picking berries is that they don’t weigh you after you’re done picking! I love to munch on them as I pick. Adorable picture of your baby!! Welcome to the world of local strawberry picking. We do it every year and have a great time with it. We make a homemade strawberry pie as our finished reward for our picking time.